In college I was lucky to have a raucous, irreverent circle of friends. Laura Manning, writer of short stories, created a moniker for me: Elaine-Brain. As I recall, Laura had a penchant for discussing bodily functions at meals. That was pretty much the only line that needed policing though. She would find it hilarious, my brain on the Internet. Today I would give plenty to sit with them again at the round table in a corner of the dining hall. Just to hear the latest, come together for an hour then head out in the world again. We used to laugh so loud. That's what I miss, the stories and laughter. Well, just my brain which they called 'unremarkable'. 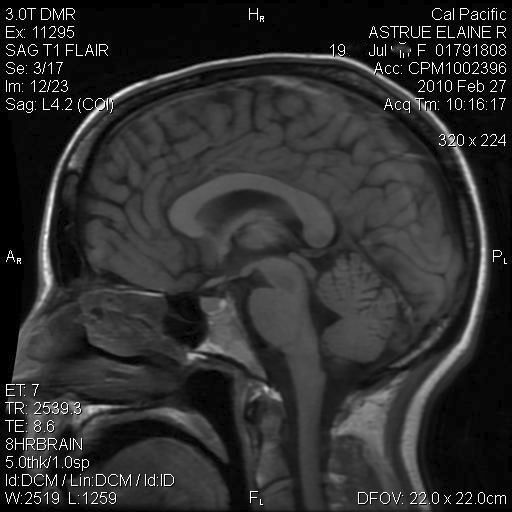 Normal MRI examination of brain without IV contrast. No evidence of intra or extra-axial hemorrhage, cerebral contusion, or other trauma related abnormality. No lesions. Unfortunately that doesn't mean I can multitask and remember stuff. It just means insurance companies can put me through hell. Thinking of donating my brain to science so it can have adventures of its own without the rest of me. I don't know if you could call it a life goal (having your corpse freak people out at the airport)... ;) A post-life goal? Are those stretch goals? Kidding, kidding.